They should have gotten a blog on their own. Rocking horses. I will do it some time later. But rocking horses definitely are extremely ornamental - so why not add them here? This here is Europe's favourite rocking horse, the best rocking horse for children I know (and I do know a lot about rocking horses!). It is manufactured in Germany by a small company in the Erzgebirge, an area well known for its high class woodwork. OK, there are lovely old-style rocking horses around. 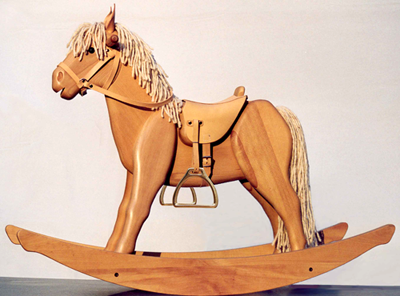 A traditional hand carved English rocking horse is a class of its own. And so is the price. Adequately. If you cannot afford such a beauty or if in your opinion this simply is too much money for a toy, then this lovely horse may well be an alternative. It is a modern horse for today's children. 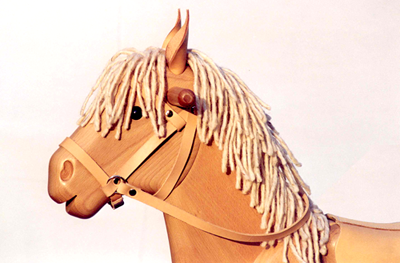 Made of solid beech with mane and tail made of pure wool and with a lovely saddle and bridle of genuine leather. The quality of this horse is excellent and will withstand children's play for generations to come. This horse is very safe (although you never should let ride very small or unpracticed children without attendance!!). It weighs about 30 lbs, which is much heavier than most rocking horses of comparable size. This, combined with the low centre of gravity and the relatively shallow rockers, would make it extremely difficult for a young child to tip over, either when riding or not. The horse meets all the required German and European safety standards. It has also been awarded a "Spiel Gut" (literally "Good Play") award by an independent German testing body, which tests toys for their value for creative play and safety. It also won an award for design and safety at the world-renowned Toy Fair in Nuremberg. These are all good reasons to buy this horse. But the best one is the horse's face. Have you ever seen a rocking horse with such a lovely face?? The horse is shipped worldwide. If you are living in Great Britain or Ireland please contact Kensington Rocking Horses through this site directly. Everybody else can contact me directly at mollyheyer@countryclassics.biz for a quote.